I was perusing through the latest updates for the city’s 2030 Comprehensive Plan when I spotted this beauty of a map. 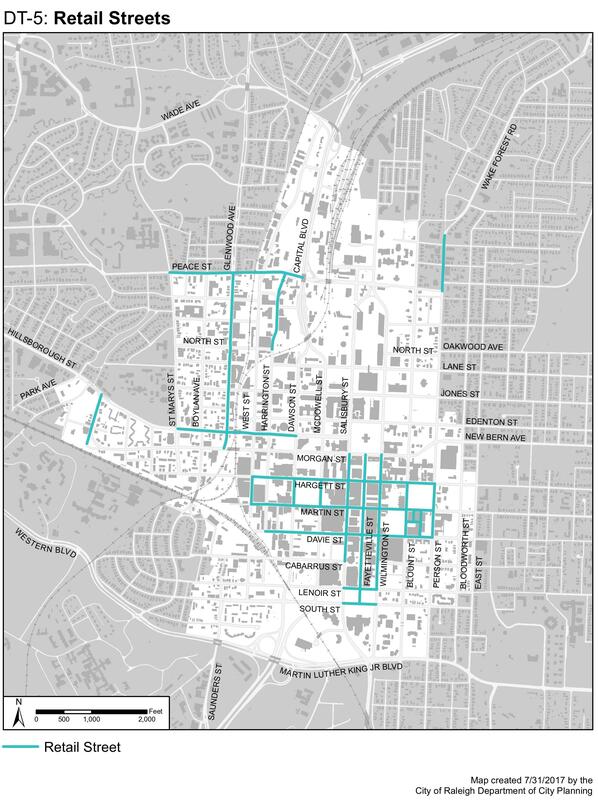 Technically, it’s not new but just a revised (better looking) map of proposed retail streets in downtown Raleigh. I wanted to post it here for reference. New developments along these identified streets should be encouraged to provide continuous, ground-floor retail and/or active spaces. That’s something to keep in mind for new proposals. Need to connect shopping districts for continuous flow. Wow! What I also see from this map is just how small our core/downtown Raleigh really is…an eye opener! @Anthony is exactly right that we can’t just have a bunch of non-connected retail streets… the downtown core is small enough as it is, my thought is: why not encourage retail space on *every* new development in the downtown area? Like why wouldn’t West St be a good retail street? Why have that one tiny strip of Morgan St over by Goodnight’s be a retail street, but not the entire rest of Morgan street leading back to Glenwood? Rather with requirements on a small core then we have a greater chance of getting those shopping districts that we really want. Remember the comp plan isn’t law so non-retail uses could still be built. Seems like someone forgot West Street? Tower (tower in this case means over 50-60 stories with 2-3 stories of Retail. @Leo excellent points. I’m hoping that with more national retailers coming downtown next year, we start seeing more people out shopping, and therefore a big surge in retail should come sooner than later. Definitely think West St, at least, should be added to this map. The inclusion of Harrington St. is rather interesting to me given it’s current status. I suppose the hope is that Capital Blvd/Peace St renovation will drive some retail. Thanks for posing this, Leo. I agree with CarnifeX, that the inclusion of Harrington is interesting. However, due to its location and redevelopment potential, there’s the ability to create something there that’s distinct from Glenwood South. I also find the inclusion/exclusion of streets around the Performing Arts Center and Convention Center a bit funny. The (retail) presence of the Marriott and Charter Square is pitiful along Lenoir Street to say the least.